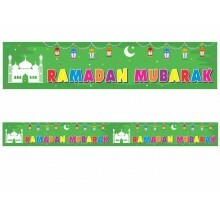 This colourful Ramadan Mubarak Double Banner stretches over 2 metres in length (22 cm height). Display it anywhere to bring out the joy and beauty of Ramadan. Matches perfectly with the Ramadan Mubarak Flags to make a set. Perfect for at home, schools, mosques or anywhere yo want to say it's Ramadan.